AMAZING SPIDER-MAN #654.1 CGC 9.8 SIGNATURE SERIES SIGNED STAN LEE VENOM MOVIE. Amazing Spider-man #654.1 First Print CGC Signature Series. Which has been signed by Marvel Comics legend Stan "The Man" Lee, the co-creator of the Amazing Spider-man back in 1962! This key issue features the first appeance of the new Venom.. It has been professionally graded by CGC, the largest independent comic grading company in the world, and slabbed in a sealed protective case. The grade is guaranteed to be high investment grade 9.8 (NEAR MINT/MINT) and this is a yellow label CGC Signature Series, which means that an authorised CGC representative witnessed the signing and this also acts as a Certificate Of Authenticity. As soon as the comic is signed, it is removed by a CGC authorised party and submitted straight to CGC for grading and encapsulation, guaranteeing the authenticity of the signature. You can check the validity of this item and the signature by entering the 10 digit number on the label at the CGC web-site. There are no cracks on the case. Any glare is just the scanner on the CGC case, which can cause reflection. We are the largest dealer of CGC Signature Series and Dynamic Forces signed comics outside of the States, with an extensive inventory of over 1,000 different issues! Items are sent securely in strong packaging. For low quantities this is a stiff oversized corrugated cardboard comic mailer. For larger quantities of comics and higher value items we use bubble wrap & poly chips in boxes. CGC slabs are sent in multiple layers of protection in strong boxes. We have over a decade's experience in comics & collectibles. 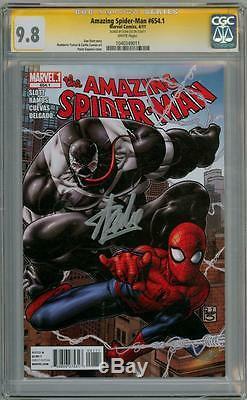 The item "AMAZING SPIDER-MAN #654.1 CGC 9.8 SIGNATURE SERIES SIGNED STAN LEE VENOM MOVIE" is in sale since Friday, October 24, 2014. This item is in the category "Books, Comics & Magazines\Comics\US Comics\1984-Now (Modern Age)\Spider-Man". The seller is "heroes-assemble-comics" and is located in Christchurch. This item can be shipped worldwide.